On March 6, Presbyterian Women Aotearoa/New Zealand, Interfaith Worker Justice, Presbyterian Women in the Presbyterian Church (USA), The Presbyterian Church (USA) and Young Women’s Leadership Development, PC (USA) co-hosted a parallel event based on Ecumenical Women’s talking points on structural violence against women. 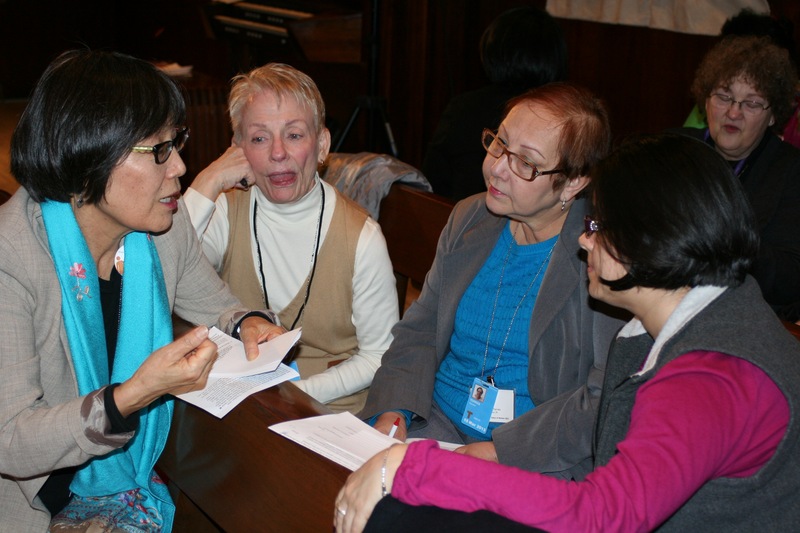 Women with a variety of perspectives shared stories of experiencing and overcoming institutional violence in the church, workplace, legal system and educational environments. Attendees were invited to discuss their own stories in small groups and work with presenters to plan action steps to take home. Sheila Louder, Vice Moderator for Presbyterian Women in the Presbyterian Church, USA, welcomes attendees to the parallel event. Pamela Tankersly and Ola Leasi, from Presbyterian Women Aotearoa/New Zealand bring Pacifika greetings and a song. Laetitia Wells, Presbyterian Women, presents the Bible text. Carmen Torres, Presbyterian Women in the PC (USA) and Alex Zareth, Young Women’s Leadership Development Field Staff (PC (USA)) present an exegesis of the Biblical story of the woman caught in adultery. Pamela Tankersly presents an interactive look at the Biblical story of a woman caught in adultery. Ola Leasi, Presbyterian Women Aotearoa/New Zealand, presents her story of encountering the institution of culture and how it can be violent towards women. Rev. Ann Rhee Menzie shares the story of her work confronting institutional violence against women in the church–and confronting violence against women in the institution of the church. Mary Ann Pedde shares her work confronting the institution of the legal system vis a vis violence against women. Sung Yeon Choi-Morrow shares her work confronting economic violence against women through the organization Interfaith Worker Justice. Break the code of silence. If you know of sexual going ons, report it to the police. Be active. Call or write congress to give your opinion either for or against what they have voted for. Call radio stations to protest hate speech. The faith based communities and churches need to talk about D.V. Open the doors to discussion. Signs in women’s restrooms with referral information – resources/agencies, etc. for those women who are afraid to speak up! Bible study as a forum to study and seek justice for women and girls – like today’s bible study. Preach! Against VAW. Hotel workers rights to have pants, work in pairs, use hotel comment cards. Collaborate with local DV, etc. programs and agencies to draw resource from them, and be resource to them as women of faith. Asking the priest to teach about women who are in the bible teach the Catholic Church about abuse, domestic violence, trafficking. To give my fear up to God. When I hinder my voice when speaking to Christian authority about authority about VAW – because I am worried I will be judged or not taken seriously. To listen to others stories. Be open to cultural practices that differ from mine and encourage those who are abused to have the courage to report. Go home and explore what is going on and begin to ask the specific questions to even know what is needed. Limited with not as many opportunities as men. Together we are powerful. Hotel industry. Share with community /church and have speakers. Speak and talk. Hotel workers housekeepers – the worsening of conditions, 2 injuries, 3 sexual abuse increase due to working alone. To include this info when talking about this event to everyone and every group I talk to – figure out how to involve youth – working on getting government involved. When staying at a hotel if we observe housekeeping working by themself – speak to the manager, then use the hotel comment cared and mail it. Continue to advocate on local, state, national and international level. Speak out at PW Gatherings, circle meetings and church. I am working to get my master’s in Health Promotion and Leadership. I intend to help minority groups (especially women) receive the utmost care and respect possible. To share with my mother’s union group. Break the silence – speak out. To explore what are some of the issues affecting unemployed mothers and teenage mothers in the wider community as it related to domestic violence. Write letters to newspaper about treatment and abuse of hotel / motel employees – maids – who are not allowed to wear pants or work in teams of two which will get more work completed. I commit to research the working conditions of the “field workers” in my community and advocate for them. Spread the word about violent practices people just aren’t aware of. I will not be silent about violence again. Connect with an organization that is active in fighting against violence against women. Continue to be an advocate for women and children of domestic violence working to change laws affecting the abuser. I identify myself with the woman caught in adultery. As I feel that woman caught in trap and allegations put on her for being vocal, active and taking initiatives. And those who were jealous of her progress were looking for a chance to blame and accuse her. As it happens to me while I was in the church after finishing my Master of Theology in women/gender studies; being active in the church and being creative sources. Some who with patriarchal ideology accused me for not covering my head during church services, by without headcovering leading the services, accused me as misleading whole church women as they believe also not bothered about to cover their heads. Later on, the church authority in the council meeting had this issue discussed. Tried to improve on me, but I preferred to walk out the church. I will share about today’s session / event to my organization / groups/ Asian groups / APWLD & AIPP – Asia Indigenous Women. I commit to find out what resources are available in my area for women in recovery from alcohol and drug abuse. I will support the hotel housekeepers’ union when they protest. UN – have women at the table. UN Security Council Resolution 1325 resolution on women peace and security. Call to share judgment. Women are same as Jesus time and modern time. They are taught to be secondary citizens. Women should obey men. Patriarchal system is like some as Jesus have and modern time. Systematic violence is happened. Nothing is new. Follow like Jesus way: listen carefully, etc. reasonably. Breaking violence. To understand the lives of women. I would like to create a forum of some sort to bring stories out of the shadow.